A part of Community Care Alliance, The Alive Peer Recovery Services is a supportive social program for people living with mental illness and/ or addiction. Alive operates in the evenings and weekends when clinical support is less likely to be available. Peer support programs like Alive offer hope and compassion while encouraging hope and resilience. All proceeds from this auction go directly towards Alive’s annual programming. You ticket includes dinner buffet and comedy show! $20 advanced tickets, $25 night of show. 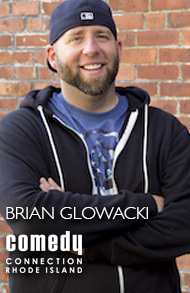 Brian Glowacki is a lovable lunatic from the mean streets of Nantucket Island. With a larger than life stage presence and aggressive likeability, he has quickly transformed from a small town class clown to a nationwide crowd favorite. Brian has made a splash in the comedy world like a fat kid doing a cannonball and is already headlining some of comedy's most well known stages. On stage he commands attention by being lighthearted with a heavy hand and is able to transition seamlessly from picking on himself, to dissecting the shortcomings of the human race. He shares personal experiences that give the audience a glimpse into his life through stories of his family, his relationships, and his interactions with some interesting characters he's met along the way. Visit our Facebook page for an up to date listing of the auction items.